Here I am, writing when I could be outside either flying the dog or ripping out more weeds from the “dry” creek. That darn “dry” creek has more water in it just now since the rain yesterday than the dog’s water bowl. I wasn’t really kidding about flying the dog as LuLu weighs just over 9 pounds and has very large ears and there is a very stiff wind blowing. Bruce and I joke around that at a time like this, hitch LuLu to her leash and let her soar instead of walk to the nearby park. Earlier this week, we got down and dirty with the chemicals in the war against Bermudagrass, various other grass varieties, and my old “buddy” – oyster salsify! Using the IPM system, we have managed to NOT hold our own against these “arch fiends” of the home and garden. Nope, not a napalm strike exactly, but the judicious use of herbicides and pre-emergents to keep from mowing in the house itself. Pre-emergents are very useful tools in order to contain weed seeds when used at the proper time. Use in October for the spring weed seeds and again in February for the fall and winter weed seeds. It’s very simple and quite easy. I missed out in October because there was no rain; with the product I use, I need at least ½ inch of water. With Bruce, no rain = no spray; it’s not that he’s not a believer, but water = $$$ which he is loathe to spend. With rain, he’s raring to go, so it got done! The grass spraying is a more delicate proposition. 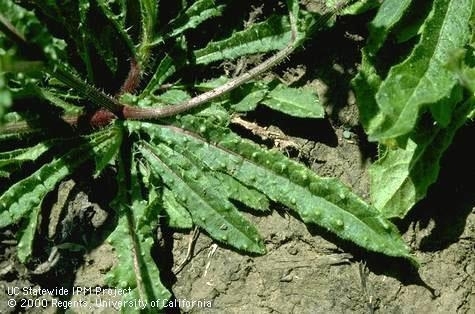 Using an all-purpose herbicide means death to any plant getting hit. So the game plan is: select the target, find an herbicide for that particular target group and read, READ the label. Select the appropriate product and use according to the directions to the letter! So far, the spraying of the grassy weeds in the rose beds, the backyard potion of the dry creek, and the other areas of the back and side yards has been completed. I’m holding my breath that the guaranteed shades of red and/or brown will appear showing the weed plants are on the way out and make the other grassy weeds quake on their roots. The last few years have been the years of grassy weeds. When we first started out here, there was nothing but tumbleweeds growing in the back forty. It only took 2 years to get rid of them but now, in a way, I wish those tumbleweeds, Russian thistle (Salsola iberica) were still here. I don’t know if you’ve read in the little magazines from the newspapers that some towns have festivals with prizes for the best use of the things and the having the biggest! Wow, my crops would have taken 1st prizes and built mansions! Alas, this information has come years too late! Next were the years of the bristly oxtongue (Picris echioides). That stuff grows everywhere, and if you get dermatitis from it as I do – it got left alone as Bruce doesn’t do “prickle bushes” and I worked well out of town. Then came dandelions and finally the oyster salsify and the Bermudagrass. Unfortunately, for this group of weeds, I’m retired now and have all the time in world – my back allowing – for pulling up and hoeing the little darlings! The beautiful thing these days is now I’m the supervisor now at home and I’ve given myself a long lunch, starting now. See ya!! I’m fighting – and losing at this point – with Bermudagrass (Cynodan dactylon). Have you ever had a gardening problem, be it a weed or much-loved plant which fails to thrive, which has you thinking that TNT might be a good herbicide? I have but I’ve decided that explosives might be frowned upon during an IPM discussion. My foe came into my yard courtesy of my neighbor. Evidently, at one time, they had a lawn in the backyard which extended from the house to the back fence and almost as wide as the entire yard. 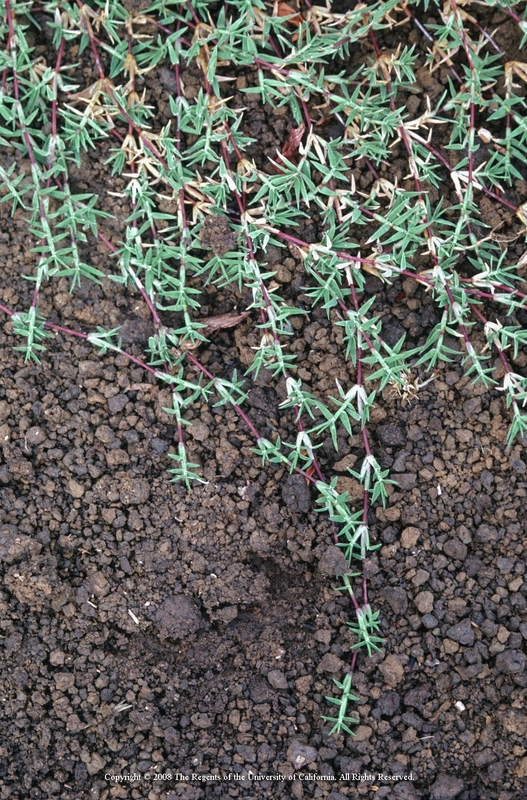 I never had any stolons come creeping into my yard UNTIL they had a concrete contractor come to install a patio. Well, very soon after that, came little fingers of green from under the fence and into my side yard. Eek, a mouse, er I mean Bermudagrass! Realizing that since I left to work at 4:30 a.m. and returned around 5pm, I had no time for this “little” green invasion, I put the other adult at home to work (or so I thought). My plan was for Bruce to use the spray bottle of herbicide on the grass slowly creeping toward my roses, but he thought the plan was to merely report the progress the grass was making! Pretty soon, it seemed like only mere minutes, my yard had disappeared under a sea of thick stems and fine leaves. What to do? Since the day I discovered that “his” plan was not “my plan”, we have been preparing to do battle! Since merely pulling the long, knotty and rather strong strands of grass is not working and our backs are tired; we have gone directly to the last step of IPM and selected our chemical allies. This process was rather easy since reading the labels on the containers (the 1st step) eliminated a number of products right off the bat. Using gyphosate will not do as it is a non- selective weed-killer and kills grasses as well as broadleaf plants. That left only the selective dicot (grasses) herbicides. By looking around, reading labels, and asking professionals for suggestions, we are using a product whose main ingredient is fluazifop which can be sprayed over the top of roses, daylilies, and other plants which are in my yard. Hopefully next year my acreage of Bermudagrass will be smaller and what I planted will be visible. That will be extremely satisfying to Bruce and me! All in all, I guess I should be happy that my neighbors didn’t plant either “running” bamboo or horsetail reeds! "So," she said, "I'd like to get rid of my Bermudagrass lawn. What's the best way?" "The best way?" he replied. "Move!" The constant battle with Bermudagrass gives fits to many gardeners and I am definitely one. I mentioned before that we were taking out our daughter's Bermuda front lawn. We started by having the top 3 inches of yard scraped by heavy machinery and carried away. 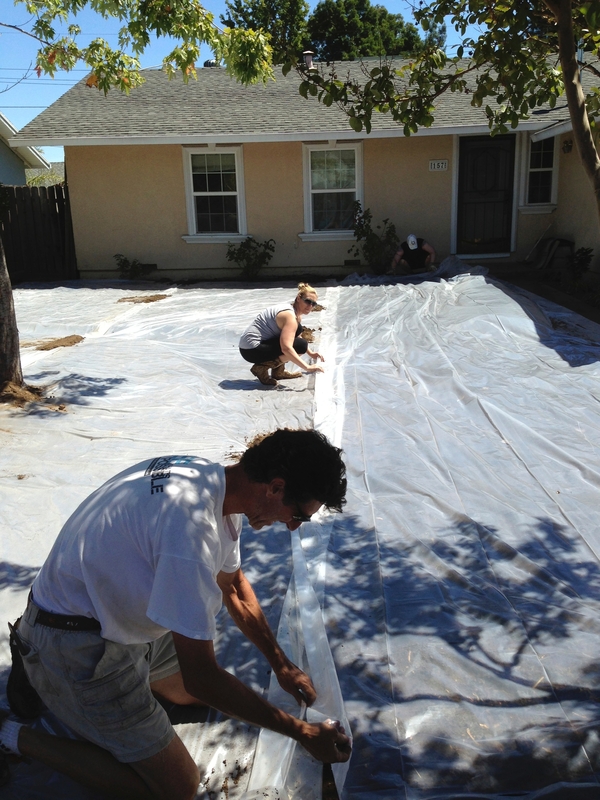 Then we covered the entire area with clear plastic to solarize the soil, intending to remove the plastic and begin hardscape construction and planting after 6 weeks. However, I just attended a very informative workshop put on by the Bay-Friendly Landscape and Gardening Coalition and the plan has been modified. Here's what I learned that might help you, too. Since Bermuda is so difficult --"sneaky and evil" in the presenter's words-- sheet mulching with a cardboard weed barrier is probably your best bet to beat it. In fact, it is a really good way to replace any lawn. First, you mow as closely as possible with a mulching mower, leaving the cut grass in place. (Okay, we scalped and solarized.) Then you cover the area with 2-3 layers of cardboard (all tape, plastic and staples removed), being sure to overlap all seams by about 6 inches so that no light will penetrate the cardboard. 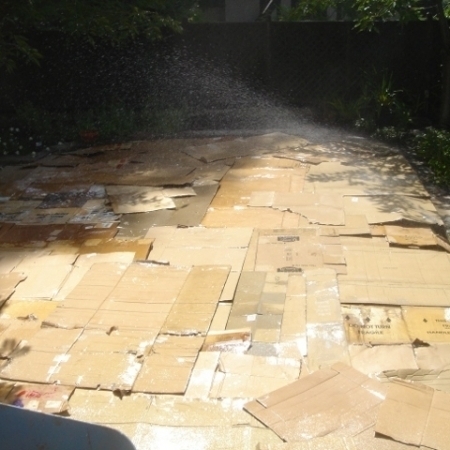 Water the cardboard well and cover with an inch or two of compost. The compost will add nutrients to the soil as the cardboard slowly decomposes over the next 24 months. If you have existing large plantings in the area, like trees that you want to preserve, be sure to leave a generous opening around the root crown for air circulation. At this point a drip irrigation system can be installed on top of the compost and cardboard, followed by 3-6 inches of mulch. Just be careful to keep the mulch 2 to 3 inches away from the trunks or stems of plants. The mulch is a critical part of the process and can be anything from tumbled glass or gravel to arbor chippings or bark. If you are fighting Bermuda grass be sure not to disturb the cardboard for a full 6 months and go for the 6-inch mulch job. If not, 3 inches of mulch will suffice and you can go ahead and cut holes in the cardboard and install your new plants. Regardless, you can plant from either 4-inch pots or 6-paks right away on top of the cardboard by just nestling the plants into a nice little planting-mix mound in your mulch.